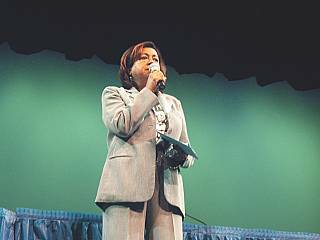 (March 6, 2005) -- A March 5 community forum at WLB's Cabrillo High School, attended by LB's highest ranking officials after a student was shot to death within steps of the campus and the WLB police station, heard residents describe racial tensions that have become part of daily life -- and sometimes death -- for some in LB's African-American and Hispanic communities. Before a capacity crowd in the Cabrillo auditorium, one adult stated -- without official denial -- that as students leave campus there is "an unwritten rule on the street" that "if you are Black, you have to walk on the left side of the street. If you are Brown, you have to walk on the right side of the street." Another speaker, a Hispanic woman, brought the room to silence on stating that her son had been shot to death [in NLB] for racial reasons. "It was a Black kid that killed my kid, for nothing, in the back. And he came down in Court and he admitted it, for the color of his skin! He admitted it," she said. 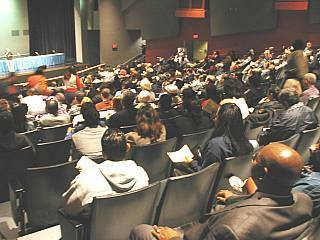 The racial divide, described in blunt but eloquent terms by a number of audience members, left attendees incredulous while others indicated it is a reality with which they cope daily. 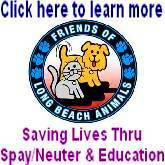 LB City Hall boasts that CA's fifth largest city is among the most diverse in the country. 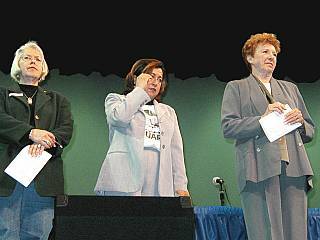 The forum opened with subdued statements by LB Mayor Beverly O'Neill and Councilmembers Tonia Reyes Uranga and Bonnie Lowenthal. Mayor O'Neill: There are people in the room who are angry...who are afraid...that don't understand and are confused...that want to help and don't know how...and are so concerned about what the future is, and I think all of us feel that way because something has happened on the 24th of February that should not happen in our community. Councilwoman Reyes Uranga: ...Really what this issue is about is communication and allocation of resources. 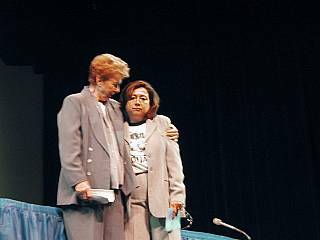 Councilwoman Bonnie Lowenthal: ...It's very difficult to be here today but I do want to tell you that Ms. Yolanda Daniels, the mother of the young man that was shot, has given me the strength to go on, and I think she's given you the strength to go on. 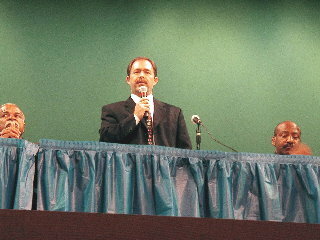 The elected officials left the stage (but not the auditorium) and a panel of non-elected officials came on stage. 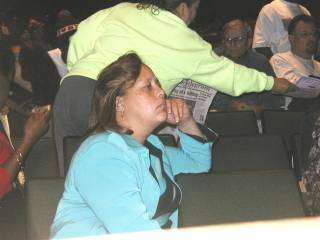 All elected officials we saw remained for the duration of the proceedings, through two hours of frequently painful audience statements. Among those we saw in addition to the Mayor and Councilmembers Reyes Uranga and Lowenthal were Councilmembers Laura Richardson (photo right) and (not shown) Councilmembers Frank Colonna, Rae Gabelich, Patrick O'Donnell and Val Lerch. [There may have been others we didn't spot]. Also present: LB Harbor Commissioner Mario Cordero; former Appointments Secretary to Gov. Schwarzenegger, Randal Hernandez; LB activists (on various causes) Annie Greenfeld-Wisner, Dan Pressburg and Shirley Vaughan...and multiple members of the LB clergy. 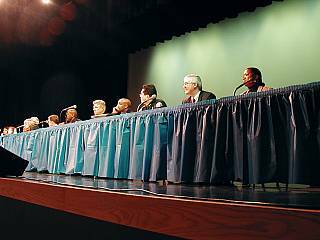 The forum featured two moderators who shared duties: LB TV host Erroll Parker and LB Community College Board of Trustees member Roberto Uranga. Police Chief Batts: I'd like to start this off by giving my sincere condolences to Ms. Daniels, to the life that was lost on the streets, and sharing my concern for what takes place in this city. I know there's people that are angry. I know there's people that are frustrated. I've had that frustration and that same anger for many years. For many years, I've stood here and I've asked this city to stand up and pay attention. 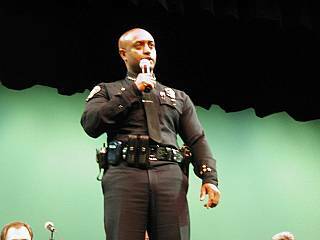 The last few years as Chief of Police, I've said stand up and pay attention. So I get phone calls every night, of lives that have been lost in the city. Young lives, young men of color, dying on the streets, dying in the gutter in these streets. And I'm not saying that to try and impress anybody. I'm saying that with honest sincerity out of my heart. I've been in this organization for 23, 24 years and I've seen too much death, too many lives lost. It's not just this one young life that's lost, last year there were 48 lives lost on these streets, young kids, consistently. And I'm not going stand up here and give facts and I'm not going to stand up here and give figures...And as much as the statistics and search warrants and arrests that we can talk about, that's not good enough. And the reason that we're here is 'cause it's not good enough. We come here today to listen. I'm not here to talk at you, to give information, I'm here to listen, and I'm here to extend my hand and say I need your help too. I am willing, and I am committed, to do anything that we possibly can to keep these kids safe, anything to keep these kids safe. But this is not a westside issue. This is not a Cabrillo issue. This is a Wilson issue. This is a Poly issue. [Audience: "Yes, yes."] This is a Jordan issue [applause]. This is a Millikan issue. [extended applause]. I've told this city and I've told the Council that we don't have enough police officers. I've been saying it for years. But I'm not going to make excuses along those lines. If we have to stop doing everything else to make sure there's enough police officers around these schools and these kids, we'll stop doing everything else [applause] to be around these kids. And I take this extremely personal, because I have a 22 year old daughter that graduated from Wilson High School. I have a 15 and 16 year old African-American sons that a bullet doesn't know that they're the sons of the Chief of Police that drive and walk these same streets that your kids walk, so it makes a difference to me. ...All of us up here, and all of us in this room, take the safety of our children first and foremost...Immediately after the shooting, we cooperated 100% with the Police Dept. The next day we had a search here at Cabrillo. We just didn't have a search here this week. We've had a search at Wilson yesterday [March 4] and we've had one the previous week at Poly. ...The Chief and I have had talks about how we can bring, and look at other resources that all of us have, to bring a second what we call "School Resource Officer" so we can add more safety for our children. Following the officials' statements, students were asked to split up into "break out" sessions. That drew audible audience displeasure and was quickly dropped...leading the forum into unplanned territory: immediate floor statements from students and adults alike for all to hear. If you are Black, you have to walk on the left side of the street. If you are Brown, you have to walk on the right side of the street. Brothers and sisters, our foreparents, the people who have made it possible for Brown and Black people to sit in this room today, our foreparents had to fight the KKK. And when our foreparents fought to the KKK, they did not have guns. They did not have sticks, they did not have weapons. 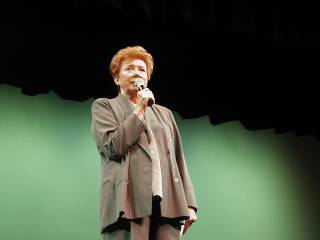 LBReport.com asked three Cabrillo students independently if the speaker's statement about a racial divide on area sidewalks was accurate. They said it was. It was not publicly denied by any official at the forum. "It was a Black kid that killed my kid, for nothing, in the back. And he came down in court and he admitted it, for the color of his skin. He admitted it...[M]y son didn't ask to be Brown. You guys didn't ask to be Black. You guys, we all need to get along. [applause]...If you don't teach 'em, they have no direction and have no sense of responsibility on that street and respect other people..."
An adult man, speaking in Spanish via English translation, said he'd been stopped and questioned by LBPD. He described his encounters with the police. He said he's not a gang member. His statements drew applause and nods of acknowledgment from several people present...but a few minutes later, an African-American man disagreed...and supported the police: "I commend the police department. I've been stopped...and I say to you: stop everyone that you feel you need to stop to get to the bottom of this crime. [applause] Welcome to America. [laughter] Welcome to America," he said, adding "This particular incident, while we label it and we know that the apparatus of the incident was a gang member or possibly gang members, it was a hate crime. [applause] It was a hate crime." Another speaker suggested that naming the school Cabrillo (for the 16th Spanish explorer) didn't properly reflect the diversity of the area. 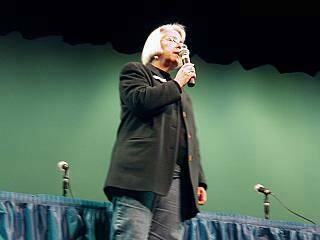 When another community member opined, "It's not about race...No!" her comments drew audible dissent. Cabrillo High Associated Student Body President Cory Morris threw a timely question at LB officials: "We have a little bit over 3,800 students at this school. And you guys said you've been asking for more police officers. If the City Council won't give you more police officers, how are you supposed to protect us? How are we supposed to feel safe here if you guys won't have enough police officers to protect us here? If we can't feel safe at school, where can we feel safe? [applause, cheers] We're supposed to come here to learn [applause continues]...to get our education but we can't because we're not safe." Community member: ...Every time I hear about one of these gang related shootings, it shows disrespect totally to me...Gangs don't represent anything that is right, anything that needs to be in communities, I don't care if you're Black, White, Brown, it is not right. And one of the things that maybe the school could implement: if you know you have known gang members in your schools, you need to pull those kids out, get them to sit down with the police officers and talk to them about the repercussions behind gang activities at the schools. [applause overriding speaker]...We have a state of the art police station right her. We have a state of the art school right here. We have a job corps, state of the art right here. But we have the things that are not representing the type of things that need to be going on at state of the art facilities. And one of things that I want to ask the police: I feel disrespected for all of this violence going on. I want to know, how do you guys feel [seeing] the disrespect that the gang members have for you guys? It is blatant disrespect to Long Beach police [sustained applause, overrides speaker again]...state of the art facility and [they] have no respect for you guys. West Division Lt. Joe Battle: Believe me, the officers have taken it to a certain extent personally, but our commitment is to do what we have to do professionally and ethically with courtesy for everybody we have to contact. But we have made a commitment that everybody who is an active gang member, who lives in this division, will know that we are not happy with this activity. Deputy Chief Robert Luna...I think we all have to remember when we talk about gang members that they didn't come from Pluto and they didn't come from Mars. They are people in our communities. That means they're our sons, our brothers and our neighbors, and it's all of us, we -- we together -- if we want to make a difference, it's us that are going to have to respond. There was a comment up there about the shooting taking place outside of the police station. Think about that for a second. Somebody with the mentality who, number one, has a gun and shouldn't, who doesn't care about another human life and is willing to pull the trigger at 2 o'clock in broad daylight across the street from the police station, who put that in his head? 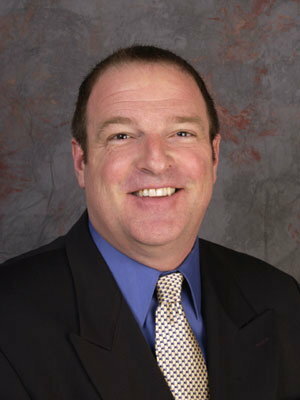 Assistant City Prosecutor Dan Murphy: ...The parents have a legal duty to control their children. They have a legal duty to make sure their children are not truant...If the parents are not fulfilling their legal duty, the [city] Prosecutor's office will consider filing charges on those parents for contributing to the delinquency of a minor. Asked by LBReport.com shortly before the forum about anti-gang injunctions obtained by the City Prosecutor's office that prohibited certain activities by gang members within an area that includes Cabrillo High, Murphy said the city recently obtained a new injunction (December 2004) that applies to the entire gang, not just specific gang members. "The problem with the old injunction was that only applied to a finite number of gang members. This one says the whole gang...so when new gang members come in, they can be served by the injunction and are bound by the injunction," Mr. Murphy said, noting that the new injunction spells out twenty conditions barring gang members from activities including congregating together, intimidating the neighborhood and possessing writing instruments that can cause graffiti. "I think the [new] injunction will be very good at getting this under control. We have a very good police department. The West Division is working the injunction. We just got the [new] injunction in place and are just implementing it now. I think it'll go a along way in curbing the violence and getting it under control," Assistant City Prosecutor Murphy said. When asked if recent events indicate anti-gang injunctions don't work, Assistant City Prosecutor Murphy said the biggest problem is "we need the [L.A. County] Sheriff to keep misdemeanors in custody...The Sheriff has an early release policy. Misdemeanor convictions are only serving ten percent of their crime." Chief Batts: ...[In addition to Cabrillo]...why is there an issue or conflict like this at Jordan High School, where I have to respond 20 to 30 units on that campus? Why is it that we just had some kids, one child get jumped and beaten over at Wilson High School? What is going on that we need to do to address at a very core level what's happening in our neighborhoods and on our campus?... [notes that a previous speaker said an incident of significant magnitude occurred earlier in Feb. at Cabrillo]...What is happening that we can work to try to solve? This is what we have to get at, because I can arrest tons of Black and Brown kids out there on the streets, and that's not solving what the real problem is. 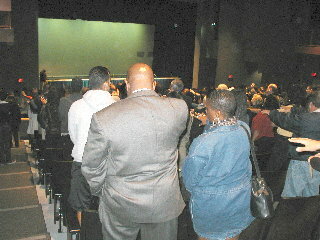 The two hour forum ended without further answers; officials promised additional meetings. 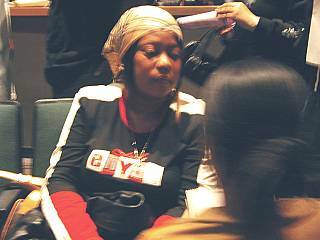 Seated near the front of the auditorium was Yolanda Daniels, mother of slain Cabrillo student Demetrius Williams. During the proceedings, community members periodically approached Ms. Daniels and offered donations to defray the costs of her son's upcoming funeral. At the opening of the forum, co-moderator Erroll Parker urged the audience to rise and extend their hands to offer condolences...and the audience did so. Prior to the forum, some LBPD officials indicated they believe victim Williams had gang associations...a contention angrily and publicly denied by family and friends. 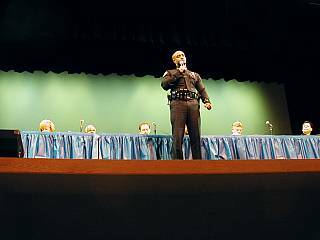 It was not asserted by LBPD officials during the forum. 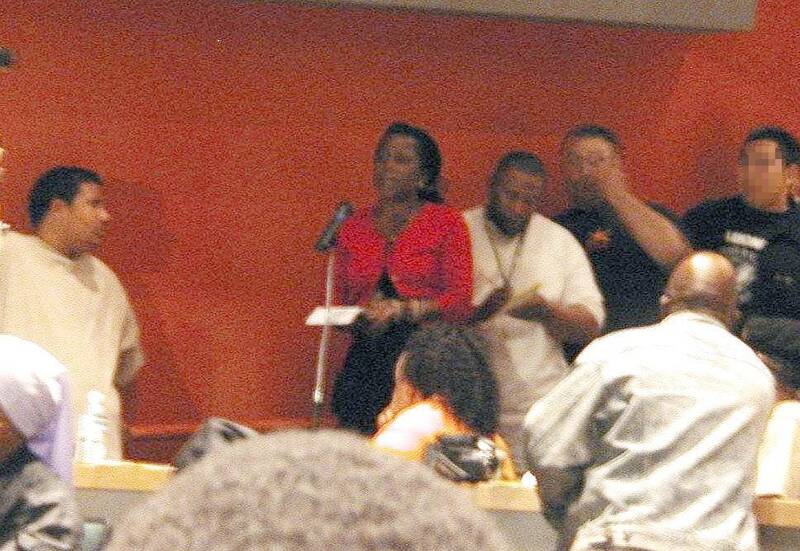 "I liked this meeting, but I was hurt because my son was not a gang banger. He was a good student. He was a lovable student. He was a fine student. But he's a hero, because it took this, right here, for everything [to come] into one place." LBPD has vowed a relentless search for his killer(s)...who remain at large as this article posts.